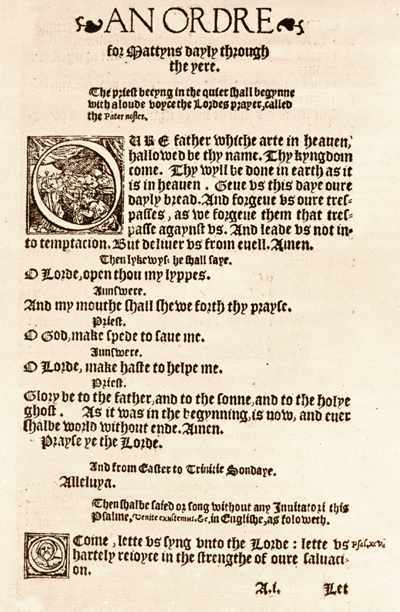 The PDF (Adobe Acrobat) files are intended to be a near-duplicate of the original 1549 Book of Common Prayer. Actual copies of the 1549 BCP are not easily available, so a facsimile privately printed in 1896 was used instead. Comparison with photgraphs of pages of the 1549 BCP show that this is a true facsimile, and duplicates exactly the original text in appearance. 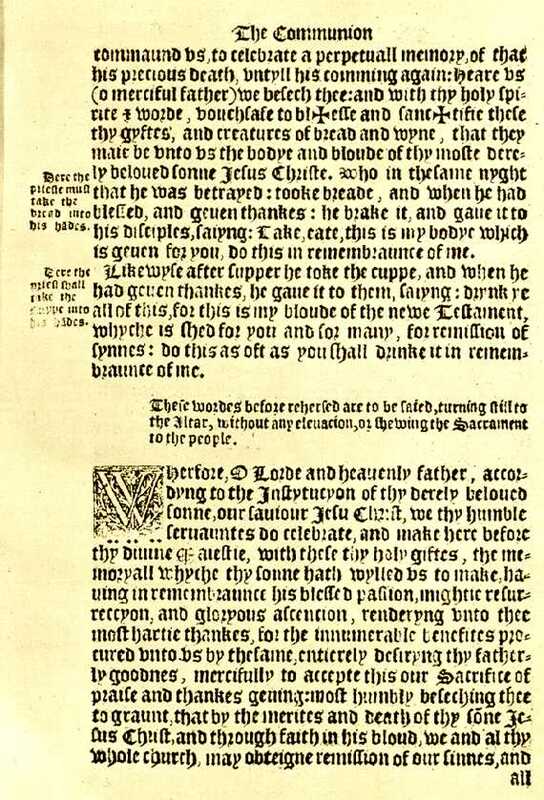 This facsimile appears in David Griffiths' Bibliography of the Book of Common Prayer as 1896/5 and copies the very first printing of the BCP, Griffiths 1549/1. 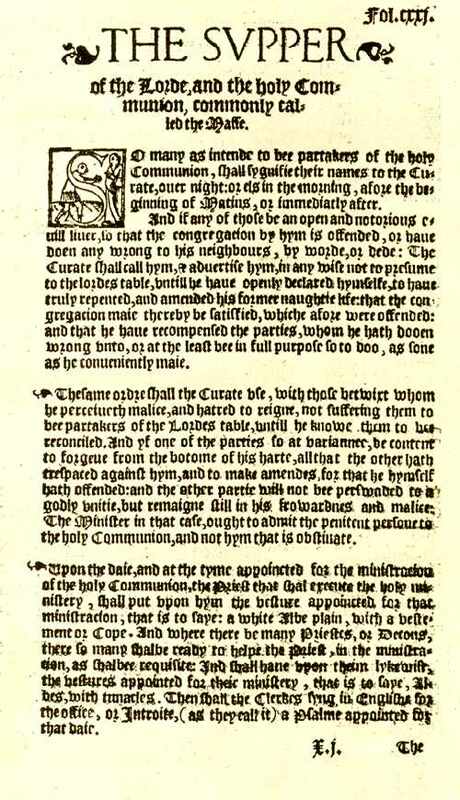 The facsimile has the same page height (28cm) as the original, but its page width is somewhat wider (22 vs. about 18.5 cm) than the original, resulting in fairly wide horizontal text margins. As the PDF files needed to be formatted for modern paper sizes, they also have relatively wide horizontal margins, as they are formatted for standard US paper: 8.5" X 11", or 28 X 21.2cm. Indications from comparisons with photographs are that the text block in the facsimile may be slightly smaller than the original, by perhaps 5%. 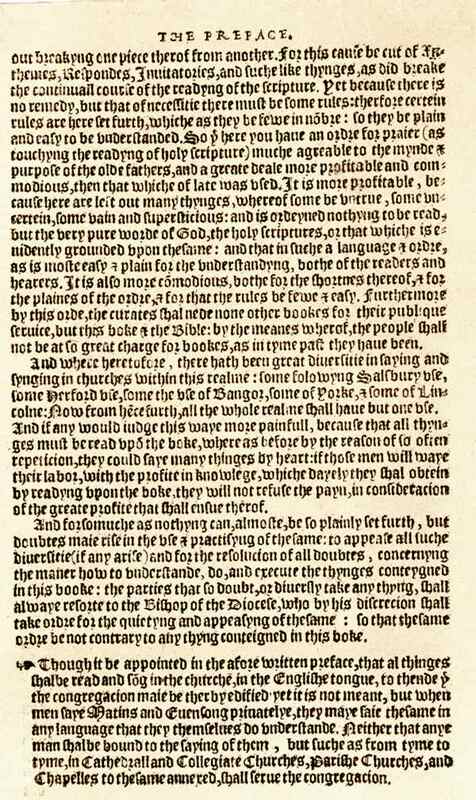 In any event the PDF text block size is indended to duplicate that of the facsimile, and does so very closely. The fonts used are JSL Blackletter for the great majority of the text which is in blackletter, and Caslon 14 for those portions in Roman. For lower case, JSL Blackletter duplicated almost exactly the font in the original; upper case letters tended to be a little different, but still similar. This font had all the required characters (long-s and half-r) and ligatures necessary, although it unfortunately does not contain the vowel-macrons, which are occasionally used in this book to indicate a dropped "m" or "n" following a vowel. In these cases the "m" or "n" were restored. Caslon 14 also had the required long-s and ligatures, and duplicated closely the Roman type used in headings in the original. However, it does not match well at all the Roman type used in small sizes (e. g., for marginal notes), which is much more of a "Chancery" style, such as Bitstream's Cataneo. However, no font could be found of this style which had the older characters needed for this text. 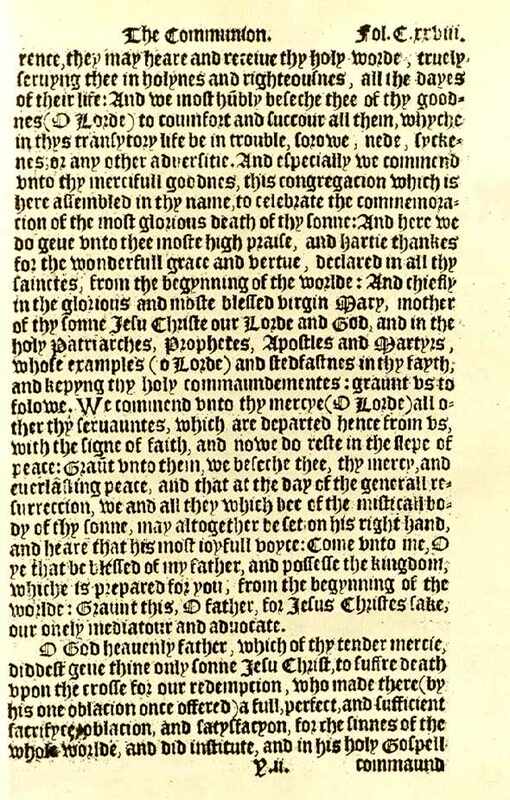 The blackletter font sizes used were 18 point for regular text and 14 point for rubrics. Leading (i. e., line spacing) seems to be slightly greater in the PDF files than in the original, but the font sizes appear to be quite closely matched. Because this text is typeset, and not a photographic reproduction of the original, one can't expect line and page breaks to be strictly maintained - and they aren't (although they are generally close). There seems to be slightly more characters per line and fewer lines per page, on average, in the PDF files vs. the original. If one wishes to make comparisons, we do have several photographs of original pages available; these are listed below. One will notice that the left and right margins in the PDF files are not equal; this is both a function of the fact that the PDF page size doesn't match either the original, nor the facsimile, and that the left and right margins of the facsimile aren't equal, either. If one wishes to use the PDF pages in a booklet, the margins are arranged such that the binding should go on the narrower margin. Although the original headers are maintained in these files, the catchword (first word of the following page) at the bottom of the page and collation (used instead of a page numbers) are omitted. Comments, corrections, etc., are always welcome; email me at chadwohl@satucket.com.